I Can’t Wait Until Ritualized Corpse Exhumation Becomes Common in The West – Thanks Diversity! There is a reason why we bury bodies and then leave them alone. In Madagascar, ceremonies in which families exhume the remains of dead relatives, rewrap them in fresh cloth and dance with the corpses are a sacred ritual. But an outbreak of plague sweeping the Indian Ocean island nation has prompted warnings that the macabre spectacle, known as the turning of the bones or body turning, presents a serious risk of contamination. On a recent baking hot Saturday in Ambohijafy, a village outside the capital Antananarivo, a “turning” procession snaked through the streets in a fevered carnival atmosphere bound for the cemetery. For the community’s few hundred residents, the time for “famadihana” — the local name for the ceremony — had arrived. 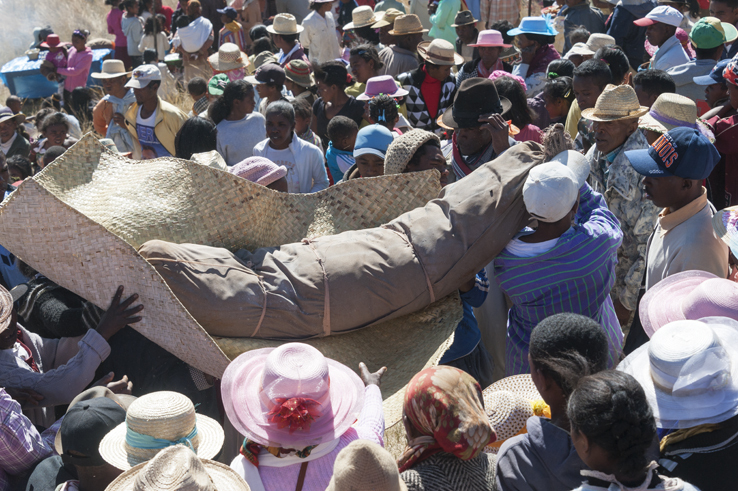 The unique custom, originating among communities that live in Madagascar’s high plateaux, draws crowds every winter to honour the dead and to honour their mortal wishes. “It’s one of Madagascar’s most widespread rituals,” historian Mahery Andrianahag told AFP. The customary ritual, rather than a religious rite, can be shocking for some, but for those taking part, it is an intense celebration accompanied by music, dancing and singing, fuelled by alcoholic drinks. As the gathering in the Ambohijafy cemetery drew to a close, the bodies were carefully returned to their resting places after one last dance. As soon as the ritual was over, the mats on which the bodies were laid were pulled up. Veteran participants will store them under their mattresses until the next famadihana. Looking after the mats is often seen in Madagascar as bringing good luck. But some doctors warn that they can also transmit germs and infections. And, at a time when Madagascar is enduring its most lethal outbreak of the plague in years, the practice of body turning has raised fears among health officials. Since August, the disease has infected more than 1,100 people, with 124 deaths. Officials this week cautiously welcomed a slowdown in infections. Health ministry epidemiologists have long observed that plague season coincides with the period when famadihana ceremonies are held from July to October.